ST. PETERSBURG, Fla. (April 7, 2019) -- Some stories just seem too good to be true. Tampa Bay Rowdies defender David Najem lived one of those moments in last night's 4-0 win over Hartford Athletic. David Najem had a tough 2018. He left his hometown club, New York Red Bulls II, for a new challenge with the Rowdies. He immediately earned a spot in the starting lineup and proved to be an emerging star for Tampa Bay as he started each of the first matches. Then the Rowdies went to play the Red Bulls in New Jersey. With his family in the stands watching, Najem suffered a torn left ACL on April 14, 2018, ending his season way too early. Entering last night, it had been 51 weeks since that afternoon. When you've waited that long to play in a competitive action, you have no time to waste to make an impact. Just 63 seconds after entering the match, Najem scored his first goal in Rowdies colors, setting off an emotional celebration all around Al Lang Stadium. All nine of his outfield teammates joined in the celebration as evidenced in the photo above. Rowdies fans went wild. Head Coach Neill Collins had big hugs for Head Athletic Trainer Andrew Keane and Assistant Athletic Trainer Michelle Leget. It was a powerful moment. It wasn't just current Rowdies that took notice. 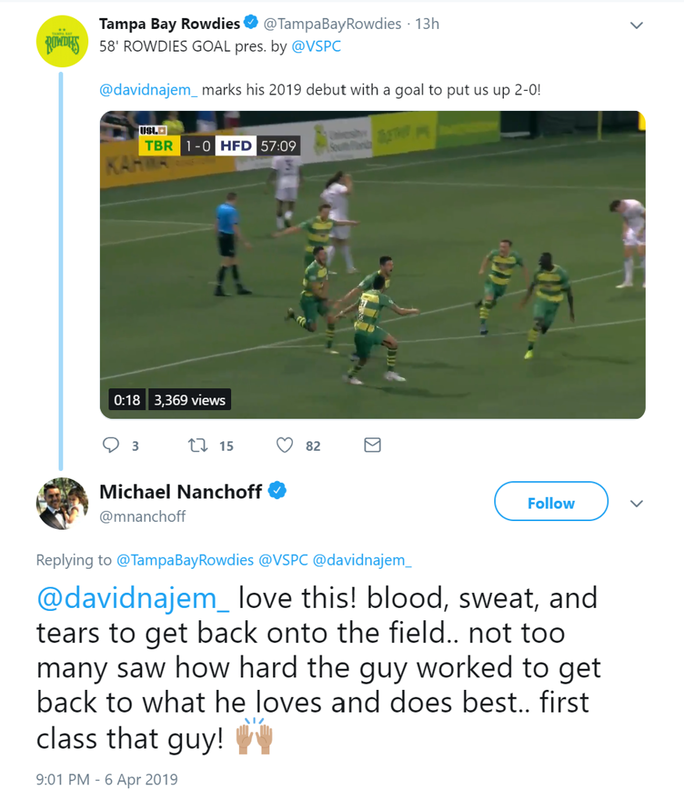 A handful of former Rowdies no longer on the roster took to social media to congratulate Najem and show their respect for how hard he worked for that moment, as well as his brother Adam Najem, who currently plays for Memphis 901 FC. He goes about it quietly, but Rowdies midfielder Yann Ekra has put in consistently great performances this season. He is yet to record either a goal or an assist, but he's been one of the key players in just about everything Tampa Bay has done this season. He just seems to win the ball in every single 50-50 and has proven nearly impossible for opponents to take the ball off of. His passing game is reliable and he has the vision to make chances for the Rowdies. Najem's goal came from a stellar Ekra effort to muscle past a pair of defenders before playing a perfect pass to fellow Frenchman Antoine Hoppenot. It was Hoppenot's saved shot that Najem put back in for the goal. It was also Ekra's pass that put Leo Fernandes in position to cross for the Rowdies first goal. Ekra completed 88 percent of his passes against Hartford, while also winning 82 percent of his duels and 100 percent of his aerial duels. He made two key passes to set up scoring situations and won possession 10 times for Tampa Bay. The Rowdies have really enjoyed home games in the month of April the last few years. Since joining the USL Championship in 2017, Tampa Bay has now played six home games in April. The Rowdies record in those matches? 6-0-0 with 17 goals scored and zero goals allowed. That record will be put to the test next week when two-time defending champions Louisville City FC come calling. Louisville has not been its usual self yet this season, with three losses in five matches, but will still provide a great early season test for the Rowdies.